Saint Stephen Parish was the second Catholic parish erected in Oil City, being formed in October of 1898 when the territory of Saint Joseph Parish was divided in half, with Saint Stephen Parish receiving the parish territory south of the Allegheny River, and Saint Joseph Parish retaining the territory north of the river. A new Saint Stephen church was dedicated on December 22, 1907 and was subsequently rededicated on June 1, 1952 following substantial renovation. The parish has never undergone any addition or division to its territory since its founding, and today it is the largest parish in terms of membership in the Oil City area. 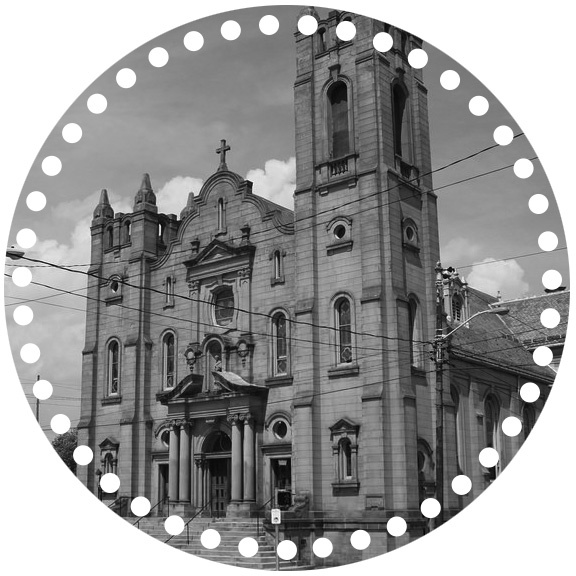 The organization of St. Stephen Parish was the result of a steady growth of the Catholic population of Oil City, which by 1898 caused an overcrowding of St. Joseph Church. The founding pastor was the beloved, Reverend John Link (1898-1904) who with the aid of the first trustees of the parish purchased property with a number of buildings attached to it including a large residence on the city’s South Side where expansion was considerable. Father Link remained pastor until 1904. Work on the church began in October of 1905 after the assignment of Reverend James F. Fielding. St. Stephen was officially dedicated on December 22nd1907 by Bishop John E. Fitzmaurice with 1000 people in attendance. The church architecture is unique in that it was fashioned after the churches of old Mexico, essentially Spanish in style. As of 2017, St. Stephen is the largest and parish and church in the Oil City area, with membership at 800 families and seats over 600 people. It also maintains the only Catholic elementary school. Mass was first celebrated in Rouseville by priests from Oil City. In 1872 a mission church was built. It was at various times connected with missions in Petroleum Center, Mageetown, and Spartansburg. Following the dedication of the present church on June 24, 1923, Saint Venantius Parish received its first resident pastor, who also served the aforementioned missions. Since the mid-1980’s, however, there has been no residentpriest at Saint Venantius Parish, and the rectory itself was demolished in 1996. Saint Venantius was one of several small mission churches in the Oil City and Titusville area. The newly ordained Reverend Edward J. Kelly constructed the first church in 1872-73. Under the leadership of D.J. Cavanaugh, plans for a new church were begun in May 1922, the 50th anniversary of the parish. The new church, a rough textured brick and Indiana limestone edifice was completed and dedicated on June 24, 1923 by Bishop John Mark Gannon. The new church construction was made possible through the generosity of both Catholics and non-Catholic members of the Rouseville community. As of 2017, St. Venantius Church is part of St. Joseph Parish.